Andrew J. Durkin ‘Drew’, a lifelong resident of Brewster, NY, died peacefully with his entire family by his side at Putnam Hospital Center on Monday June 11, 2018. He was 89 years old. Born on July 29, 1928 at Mt. Kisco Hospital in Mt.Kisco, NY, son of Andrew J. and Mary (O’Brien) Durkin. He attended St. Lawrence O’ Toole Catholic School and graduated from Brewster High School in 1946. Drew honorably served in the US Army during the Korean War. Mr. Durkin married the love of his life Maureen Costello on April 16, 1955 at St. John’s the Evangelist Church in Mahopac, NY. They were blessed to be married for 63 wonderful years. Drew was the co-owner and president of Durkin Fuel of Brewster and Pawling, NY. He was a past commissioner of the Brewster Fire Department for 25 years. 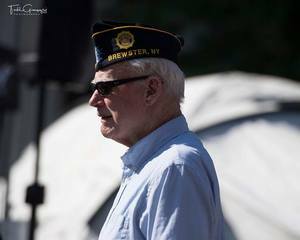 He was also a member of the VFW Post 672, the American Legion and a charter member of the Brewster Elks Lodge. Drew was also a member of the Brewster Lions Club for over 65 years. He was an active parishioner of St. Lawrence O’Toole Church and a member of the Knights of Columbus for over 50 years. Mr. Durkin is not only survived by his loving wife, Maureen, but also his 7 children; Maureen (Donald) Gibson of Florham Park, NJ, Andrew (Susan) Durkin of Pawling, NY, Thomas R. Durkin of Brewster, NY, Kathleen (Patrick) Evans of Rhinebeck, NY, Anne (Bruce) Hoelzl of Wilton, CT, Sheila Durkin of Brewster, NY, and Raymond C. (Nancy Schneider) Durkin of Brewster, NY, his 12 grandchildren; Meaghan, Clare, Erin, Andrew, Brian, Craig, Molly Kate, Peter, Celeste, Cara, Justin and Jack and his sister Virginia Kaminski of Buzzards Bay, MA. He was predeceased by his brother James Durkin in 2012. A Mass of Christian Burial will be celebrated on Friday June 15, 2018 at St. Lawrence O’ Toole Church, Brewster, NY at 1pm. Interment will follow at St. Lawrence O’ Toole Cemetery. Friends and family may call the Beecher Funeral Home, 1 Putnam Avenue, Brewster on Thursday June 14th from 3pm-8pm. In lieu of flowers donations in memory of Drew may be made to either St. Lawrence O’ Toole Church, 31 Prospect Street, Brewster, NY or the Brewster Fire Department, 501 N. Main Street, Brewster.